Over the last 2 weeks we have been looking at dairy. We have looked at the arguments for and against, and my own experience of consuming dairy and generally looked at if dairy is a healthy addition to your diet. To catch up , here is part 1 and part 2. So you may be one of the many people who are dairy intolerant and avoid dairy. Maybe it aggravates your eczema, makes you bloated, sick or have diarrhea or just blocks up your sinuses all the time. You then may be one of the many people who uses a dairy alternative. Soya milk, margarine and cream are supermarket regulars, as are now almond, oat, rice and lacto-free dairy milk. In fact there is such an array of dairy free milks that avoiding milk doesn’t need to be such a hardship – it can be a doddle. Fo me, I have a genetic predispostiive that means I dont digest milk very well (runs in my whole family and started when we were babies). So I first went was dairy free at 16 and have pretty much been off since then (I can be waaaay more lax about it now that I have healed my gut more so I will have occasional cheese and milk). And for many years soya milk was a staple of my diet. I drank it everyday and feel in love with its nutty taste and I repeatedly heard how amazing soya was for your body and health. 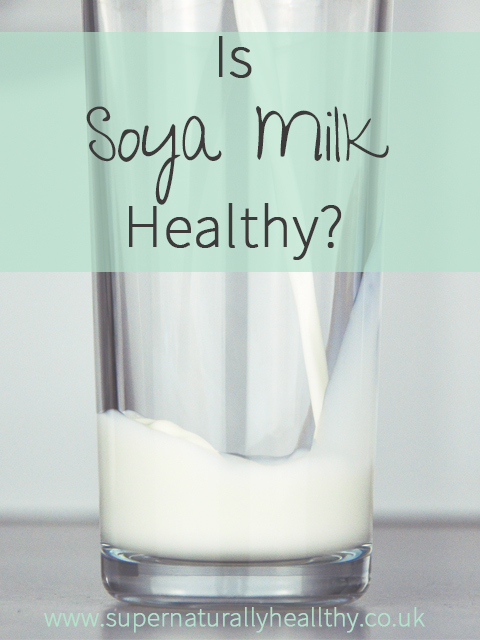 But is Soya Milk Healthy? Surely it must be! We have all heard that the highest mortality rates are those who live in Asian countries where soy is consumed? Also, it comes from soy beans – that is pretty natural surely? I used to love my steamed soya milks until I read more and more about the soya industry and the effect it has on our bodies. The soya we find in soya milk and other food is soy protein isolates which is made by removing all the fibre with an alkaline solution and then placing it in an acid wash in a aluminium container which mean the soya absorbs the aluminium and has been heavily chemically processed. Aluminium has been linked to dementia and other mental disorders. What the soya makers do is then make this heavily process soy into a powder and add the water for milk or hydrogenated (BAD) oil for margarine. Nice. Soy is a natural goitrogen, which means that it impairs iodine absorption and reduce thyroid function. Poor or low thyroid function leads to w hole host of health problems like PMS, constipation, and weight gain to mention a few and low iodine effects many things with metabolism efficiency being one. Soy has high amounts of phytoestrogens and oestrogen’s which can cause hormone imbalance and disrupt both men and womens delicate hormone balance. Many doctors or health literature would say that the phytoestrogens content is a good things especially with those with a hormone imbalance as surely eating food with high levels of what you are lacking in is the answer? Unfortunately not. I by no means claim to a phytoestrogens expert but it seems to be a fairly complicated area with much research linking it to cancers, hormone imbalance and worse. Soy may patch a problem temporarily ( like in menopausal women) but creates more health problems in the long run. There is so much hormone like substances in soy I read that to a child it would be the equivalent of taking 4 contraceptive pills! Soy contains lots of phytates which are found in many legumes and pulses, but especially high in soy. Phytates are enzyme inhibitors and disrupt digestion as they bind with vitamins and mineral preventing them from being absorbed. They are anti-nutrients and inhibitors that prevent you getting the full natural goodness from your food. Soy is very often genetically modified and been altered with in order to meet the high demand place on it. Most processed foods will contain the heavily processed (acid washed stuff) in it to help bulk it out. In order to ensure food industries get enough of this crop the 90% of the beans have been tampered with and are no longer natural in any sense of the word. Food Inc documentary touches on this in a bit more details. There are many more reason and studies done to show the negative effect, read here to see a summary of the studies done over the last 50+ years. As for our western assumption that Asian countries eat loads of soy products and still remain healthy and slim , this is a misconception. They do indeed eat small amounts of traditional fermented soya products but only as an accompaniment to other foods. Miso, Temph and tamari are all more traditional soy products that are not eaten in large quantities and are traditionally produced – these are the only soya products I will eat. So soya in itself is not looking great, but then take the further processing of soya into soya milk, margarine and other processed stuff and the picture looks bleaker still. Maltodextrin is not a great addition to your diet. It comes from rice or corn and is heavily processed, has twice the glycemic index of sugar, extends food shelf and basically behaves like fake sugar causing insulin spikes and fat storage. Yum. So add that the nasty processed ingredients with the acid washed and genetically modified soya beans – no wonder it wrecks havoc on your body! But in my opinion (feel free to make your own!) I would say traditional, non GMO soya products like miso, tamari sauce and high quality organic tofu could be eaten occasionally, but if you suffer from hormone imbalance, infertility or other thyroid issues I would avoid all together (except for if you have very low estrogen). Avoiding it mean reading all processed food labels as it is sneakily in many things. There is a whole host of other alternative out there which we will look at over the coming weeks but generally if you can’t drink milk then you need to reduce your milk usage and aim use only natural homemade alternative, but more on that next time. So if you have the choice between a organic full-fat milk latte and a soya one – go with the cow! Or an americano if you are lactose intolerant! Was that a surprise? Are a big soya milk drinker? I’ve just converted to soya milk due to a recent blood test flagging up a cows milk allergy!! A relative told me about this issue with soya milk 😩😩😩 So I’ll have to consider the information stated here, and perhaps now trying almond milk . Thing is I have a walnut allergy to, and unsure if I have allergies to other nut based products! My partner’s family are all incredibly intolerant to ANY form of Soy, resulting in bloating, painful guts, sudden dashes to the loo and a need for sleep within an hour of consuming. Bread esp in when eating out in restaurants. Food labelling in UK should mean that is now as a minimum in BOLD on ingredients listing or (*contains Soy or Soy Products) labelled. It is also a recognised allergen so should be on a food establishment’s Allergy Menu which certainly English & Welsh establishments have to have. Partners family is soooo reactive to it, we don’t go ANYWHERE to eat unless they can provide an allergy menu or speak directly to the cook if everything is home produced.